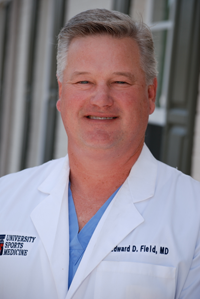 Dr. Field has been serving North Mississippi and the Oxford community for 18 years. Dr. Field is a leading orthopaedic surgeon in the field of sports medicine. In addition to his clinical practice, he has served as the Team Physician for the University of Mississippi, Mississippi Delta Community College, Northwest Mississippi Community College, Rust College and multiple area high schools. Dr. Field also served as the Associate Team Physician for the U.S. Alpine Ski Team. Dr. Field is a Mississippi native and received his undergraduate and medical degrees from Tulane University in New Orleans. He completed his residency through Tulane University Affiliated Hospitals. After his residency he completed two internationally recognized fellowship training programs with the Steadman-Hawkins Clinic in Vail, Colorado and with the Hughston Sports Medicine Hospital in Columbus, GA. While at the Steadman-Hawkins Clinic in Vail, Dr. Field worked directly with the most experienced physicians in the field of sports medicine, treating professional and Olympic, high-profile athletes. He traveled extensively with the U.S. Alpine Ski Team, serving as their Team Physician. During his fellowship at the Hughston Sports Medicine Hospital, Dr. Field worked with numerous regional sports teams, including Southeastern Conference teams, and gained extensive surgical experience. Dr. Field is a member of the American Medical Association, Hughston Knee Society, National Athletic Trainer's Association, Hawkins Society, Mississippi State Medical Association, North Mississippi Medical Society, Mississippi Athletic Trainers Association and the North Mississippi Physicians Association. In addition, Dr. Field holds a teaching appointment at Tulane University School of Medicine as an Associate Clinical Professor. Dr. Field has a special interest in sports related injuries and conditions, while he enjoys delivering orthopedic care to all patients. Dr. Field regularly advances his surgical expertise by using the latest technology and obtaining training in cutting edge surgical techniques and procedures. An avid sports fan, Dr. Field enjoys watching sports, playing golf and tennis, duck hunting and swimming. He also spends time planting and cultivating dog wood trees and maintaining his Bluebird trail. He and his wife, Julie, live in Oxford with their two children.